WHITEFISH, Mont. - The works of great men last long beyond their passing, so it was fitting that the memorial service for Ben Cohen was in the community theater he helped found, at the base of the mountain he loved to ski. Friends, family, former and sitting Supreme Court justices, legislative colleagues, ski buddies, and the guys who drive the trucks of Ben's garbage service filled the comfortable space to cry, laugh, tell stories and honor the 57 years of life granted to this remarkable man. 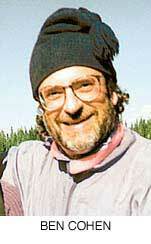 Cohen died of a heart aneurysm Feb. 5 in Whitefish. He served in the Peace Corps in Nigeria, attended the Massachusetts Institute of Technology and added a master's degree in educational psychology from Temple University to his undergraduate degree in math. When he came to Montana in 1970, the state worked its magic on him and changed his life completely. After working as a teacher, wilderness ranger, firefighter, and house builder, Ben and his wife, Connie, started North Valley Refuse, serving the Whitefish area. Some will laugh to think of so much education and brain power used to run a garbage route, but not Ben. He got to live in Whitefish, ski his beloved Big Mountain and raise Rajal and Isaac on the edge of Glacier National Park. In repayment, Cohen worked hard to make Whitefish a better place to live. He founded the youth soccer league and helped start the Whitefish Community Theater, acting in its first play, Don't Drink the Water. In 1985, Ben was elected to the Montana House of Representatives, where he put his intellect and skills to work protecting the natural world. To preserve the water quality of Flathead and Whitefish lakes, the freshman legislator carried a bill allowing counties to ban phosphate-containing detergents. With a ragtag band of public-interest lobbyists, Ben took on Proctor & Gamble, one of the mightiest corporations in the nation, and beat it. Representative Bob Raney recalls: "Here were all these high-powered lobbyists flown in from all over the nation, filling the room to fight the garbage man from Whitefish. They should have won, since they had more lobbyists than there were legislators on the committee, but Ben's idea made sense. Why pay millions to take phosphates out in tertiary sewage treatment plants when, just by changing detergents, we could avoid them in the first place? He probably did more for Flathead Lake than anybody just by banning phosphate detergents." Cohen served eight years, always fighting for a clean environment, always a champion for citizen involvement in government. Just before he died, he wrote a fund-raising letter his daughter later found on his computer. It begins, "I want to serve in the Montana Legislature again." He won't get that chance, but for those who knew him, who respected his ability to pull the best out of the people around him, and who understood his dedication to an honest and open deliberative process, Ben's spirit will always be there.